Fortunately, in the last five years, there’s been increase in awareness and educational efforts made toward food gardening, and a significant shift has been made toward more Americans growing their food. Agricultural organizations, urban farming groups, farmers markets, and community gardens can be found all across America, in major cities and even smaller towns, and are making it easier for people, even children, to learn how to grow their own food at home. Chicago is one city that has been touched by this movement and is home to many organizations of the like. Advocates for Urban Agriculture (AUA) is a coalition of individuals, organizations, and businesses working to support and expand sustainable agriculture in the Chicago area from home- and community-based growing to market gardens and small farms. 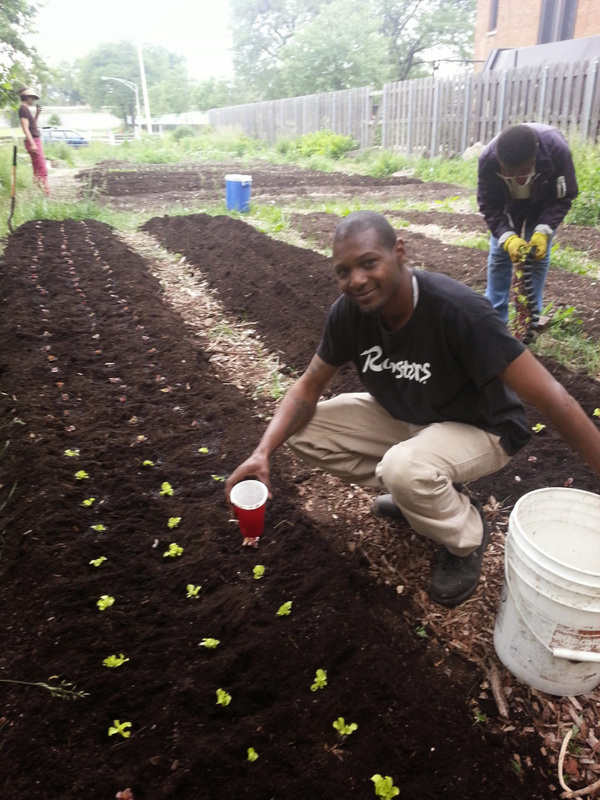 Their website serves as a comprehensive hub for projects, activities, information, resources, and opportunities in Chicago’s urban agriculture scene. Eat to Live Englewood gardener transplanting seedlings. Growing Power offers an array of workshops for the novice through advanced farmer. Individual workshops are $100 and one can enroll by visiting their website or contacting them. Growing Power also provides volunteer opportunities for youth to complete their service learning hours, a requirement for school. 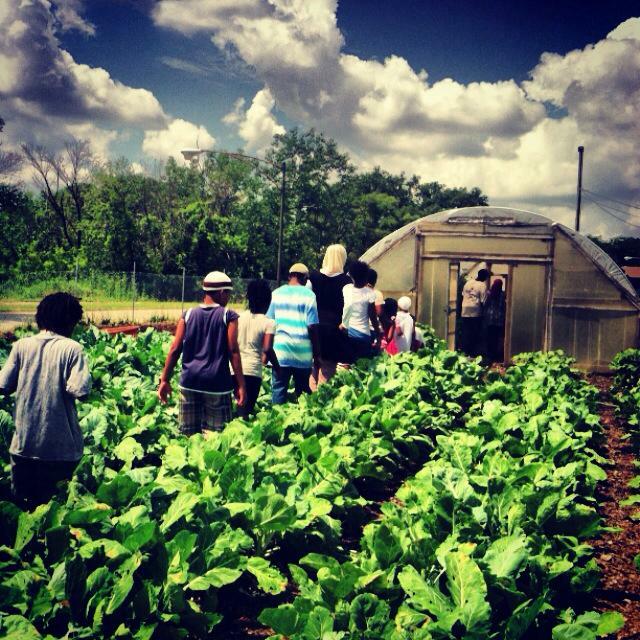 In this capacity, students assist the Growing Power team with building a 7-acre farm in an industrial building in the middle of Chicago at 3333 S. Iron St.
Eat to Live Englewood/E2L is a project to build a healthier local food system and economy in the Englewood community of Chicago. E2L is led by Angelic Organics Learning Center in collaboration with partners in the immediate neighborhood and beyond. E2L has two learning gardens where community members can learn and grow. The gardens donate produce to volunteers, neighbors, and a nearby senior center and women’s shelter. Additionally, E2L has an incubator farm where new urban farmers can launch their businesses. E2L hosts ‘learn and grow’ sessions in the spring, summer, and fall, workshops, community special events, and tours. E2L will also introduce people to ways they can get more healthy food by participating in buying clubs and community-supported markets. To learn more, visit their website, or contact Martha by phone or email. You may also join them in the “Prin and Vin” gardens on Tuesdays & Thursdays (weather permitting). The Peterson Gardening Project is a revolutionary, non-profit, community garden with multiple pop-up Victory Garden locations around the city of Chicago. The mission of this organization is to teach people how to grow their own food, and these pop-up gardens serve the primary purpose- to teach people in urban settings that it is possible. 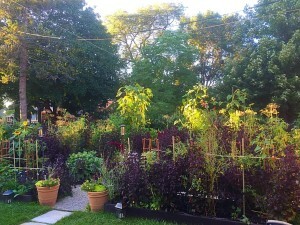 People interested in gardening with the Peterson Gardening Project do not need any prior gardening experience. Peterson Gardening Project also offers additional enriching workshops and classes. 2016 registration is open now! Membership to Peterson Garden Project is $85 for the year and includes education, events, some supplies, and a 4×8 garden plot in one of its organic Pop-up Victory Garden locations-Rogers Park, Andersonville, or Lincoln Square. All gardeners are required to attend a mandatory annual orientation/member meeting.To apply, visit the website and complete the applicaton. Garden plots are assigned on a first-come-first-served basis. Spring is upon us. It’s time to get in touch with the Earth and return to a way of life that makes sense. Reach out to your local community garden and urban farming groups and get involved. With the availability of these resources, what reason do you have not to? Or better yet, can we really afford not to?